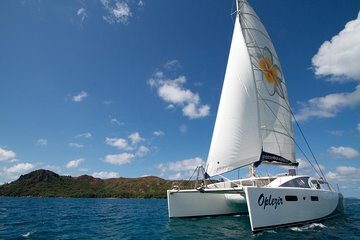 Follow in the footsteps of Robinson Crusoe on this adventure cruise departing from Praslin Island. This multi-stop, carefully-curated itinerary is made easy with all transportation and a barbecue lunch included. Swim and snorkel at St. Pierre Island, see the giant land tortoises at Curieuse Island Reserve, and trek through the mangrove swamps at Anse Josee. The last stop is a swim at Anse Georgette Beach, followed by a cruise up the northeast coast of Praslin Island for drop-off. for transfers between the Islands will apply. Our Representative will provide you with the information needed to include the land & inter-island ferry costs.